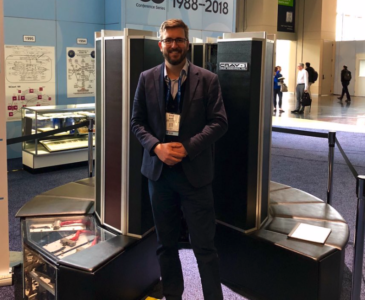 The Pawsey Supercomputing Centre recently returned from SC18 – the largest and prestigious international supercomputing conference for all things High-Performance Computing (HPC). 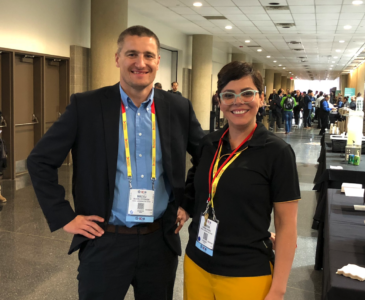 Hosted in Dallas, Texas, the exhibition floor at SC featured more than 350 exhibitors in the industry and research communities, from over 100 countries. 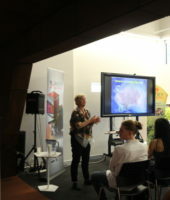 Australian HPC was represented by a joint booth from NCI and the Pawsey Supercomputing Centre. The highlights for Pawsey were extensive – Pawsey engaged with over 700 attendees including vendors, stakeholders, partners, researchers and more in the name of expanding HPC expertise and collaboration. The Centre contributed to three Birds of Feathers (BoFs) and a workshop focusing on education, outreach, training and engagement. As part of a full day workshop, Pawsey staff presented an ‘Australian perspective on HPC education and training’ including outreach. The workshop also showcased ‘The Impact of MOOC Methodology on the Scalability, Accessibility and Development of HPC Education and Training’ by MIT and EPCC, ‘Towards an HPC Certification Program’ by the University of Reading, ‘Evaluating Active Learning Approaches for Teaching Intermediate Programming at an Early Undergraduate Level’ among others. Pawsey staff were also part of the panel discussion during the same session, providing insight and also encouraging the discussion. Please find here Pawsey’s submission and presentation. The HPC community is delivering HPC educational content and training to address workforce preparation at all levels – from undergraduate students to career professionals. Flexible and scalable pedagogical and andragogical approaches are needed to address the broad workforce needs from the basics of computational thinking to extreme scale performance. Through brief presentations followed by open discussions, this ACM SIGHPC Education Chapter coordinated BOF engaged the audience in discussions of the challenges and solutions for scaling-up and sustaining successful HPC teaching and learning. The activities include formal courses, MOOCs, extracurricular activities, webcast training, and Carpentries models of teaching and learning. As part of the ACM SIGHPC Education Chapter representative, Maciej Cytowski, Pawsey supercomputer specialist, was one of the organisers. 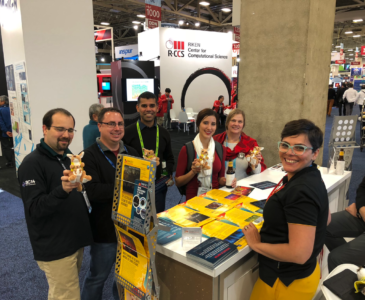 The HPC community has consistently identified public outreach and education of new and existing community members as vital to the growth of the field. New strategies and alternative teaching methods are needed to improve access, promote diversity, attract new HPC practitioners, and encourage the next generation of scientists and gain the support of the general public. To share effective strategies, practices, and spawn new ideas to meet the challenge of providing accessible, inclusive and scalable HPC outreach, education and training, during this BoF combination of discussion and demonstrations of existing training and outreach activities were used. It was a collaborative effort that included representatives from EPCC, Pittsburgh Supercomputing Centre, IT4 Innovation, XSEDE, IRISA Laboratory in France, MIT Lincoln Laboratory, Georgia Institute of Technology and Centre for High-Performance Computing, South Africa, and Pawsey among the organisers. In the context of a set of concrete examples, such as the Large Hadron Collider and Square Kilometer Array, this BoF discussed both current and projected requirements for processing, storing, sharing, and securing of data as well as data quantities, processing needs, and expected data transfer needs with the goal of collecting an aggregate set of requirements from the LSFs allowing for gap analysis of these requirements against the roadmaps of international HPC data centres. PRACE, XCEDE, CHPC-South Africa and Pawsey were some of the organisers. The session focus on presentations from Michelle Butler from the Large Synoptic Survey Telescope, Andreas Wicenec from ICRAR, Burt Holzman from Fermilab and Maria Girone from CERN, followed by a discussion from the attendees. 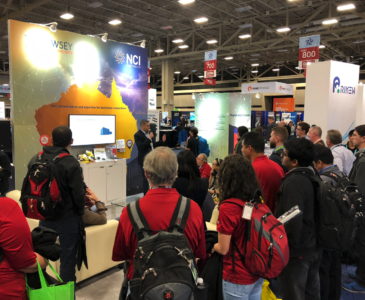 Pawsey also hosted two Kookaburra Talks (mini presentations) at the booth; one on Containers in HPC and the other on the Pawsey Expansion Project – a focus on ZeroWatt Storage (ZWS). This year the conference’s keynote speaker was Erik Brynjolfsson of MIT who explored How to Deploy the Unruly Power of Machine, Platform, and Crowd and asked the key question on everyone’s lips at the event – Will you be the disruptor or the disrupted? 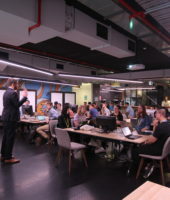 This is one of the key reasons Pawsey participate in conferences such as SC – our staff have the opportunity to refresh their skills, learn and adapt to technologies that are revolutionising industry and bring these concepts home for our researchers to continuously advance Australian science, while promoting the science that is done in Australia with the support of both tier 1 supercomputing facilities.